Tall-sided, western freight wagons. Throughout the American West, they were truly giants on wheels. Evolving from the early Conestoga freighters traversing so much of the eastern U.S., these pioneering behemoths did more than carry ore, goods and supplies. They helped open, grow and sustain the American frontier while broadening the footprint and foundation of an emerging nation. With imposing physical statures, these commercial Goliaths dominated the western landscape. Many measured fourteen to sixteen feet in length with individual hauling capacities of 4 to 8 tons. Standing empty, they could easily weigh in at 3 ½ tons. It's a statistic comparable with a full-size, heavy duty pickup truck but, with as at least 3 to 4 times more payload capacity. Reinforcing its mammoth size, this 1890's tall-sided freighter significantly dwarfs a full-size Concord Coach. The rear wheels of these wood-carved creations could stand well over a man's head while the metal tires were often doubled in thickness to minimize worries of wear while also helping reinforce the overall structure of the wheel. Tire widths could range considerably and generally fell anywhere between 2 to 8 inches.1 It was a factor typically determined more by the terrain and ground condition than anything else.2 The mammoth frameworks were built by an almost countless parade of makers, many positioned near the Mississippi and Missouri rivers since these areas were pivotal transportation centers helping feed and grow virtually all parts west. All in all, this was a transportation empire like no other and competition within it was not for the faint of heart nor light in financial backing. To get an idea of the size of the industry and a sense of the competitive risks, one need go no further than primary source accounts of the day. One such report took place in October of 1887. Addressing the 15th Annual Convention of the Carriage Builder's National Association (which included wagon makers as well), Clement Studebaker, the President of Studebaker Bros. Manufacturing Company, quoted from statistics indicating there were 80,000 horse-drawn vehicle manufacturers in the U.S. at that time.3 Fifteen years later, the numbers had dramatically declined but, turn of the century directories still listed nearly 40,000 makers and repairers of horse-drawn vehicles.4 It's a surprising number that does not include an equally impressive count of related supplier industries. During a time when hard work and sheer grit could conquer the biggest mountains, clearly, this industry was massive and built on a scale to make things happen. 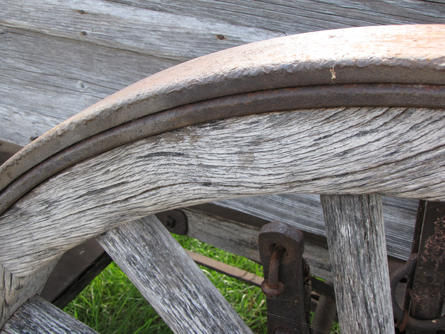 Double tires on early wagon wheels are typically indicative of use within rugged, mountainous terrain. Early catalogs from well known makers like Fish Bros., Studebaker, Peter Schuttler, La Belle, Mitchell, Weber, Kansas, Jackson and others provide valuable details on standard freight wagon designs as well as notations regarding custom work available.5 While pre-Civil War wagon literature is extremely rare, by the late 1860's, printing became more affordable and available to businesses. As a result, the larger firms, in particular, began to produce a steady supply of promotional materials and advertisements. No longer was it left to word of mouth and simple newspaper text to reinforce individual brand preference and desirability. Elaborate wood cuts and full color illustrations of notable wagon brands seized the legacy and lure of the West as part of an almost unending barrage of promotional campaigns. Numerous journals and newspaper accounts reinforced this presence with regular reports of extensive wagon movement west. Progress, though, is never content to rest on its laurels and, even with all of their historical importance to commerce, the ebb and flow of animal-drawn freighters significantly waned as the 20th century arrived. The benefits of improved infrastructures and expanded railroad service along with the increasing acceptance of motor trucks and faster delivery time expectations all played a role in bringing this part of American history to an end. So, with the thousands of freight wagons built, where are all of these rolling legions parked today? To be sure, there are a limited number of them scattered among individual museums and government entities as well as a few corporate and private collections. However, as these stand in silent tribute to the hand-built transports that built a nation, the vast majority appear to be forever lost. Victims of use, abuse, neglect and a bygone era, the small sampling of survivors makes for a legacy that is, at best, incomplete and highly susceptible to supposition and generalizations. Ultimately, it's a loss of American history so drastic that Mark Gardner in his well-written book, ”Wagons for the Santa Fe Trade,” laments the disappearance of these icons of the West. In fact, it's his belief that not one of the freighters that traveled the Santa Fe Trail is still in existence. It is quite possible that he is correct. For, in spite of the fact that there were thousands upon thousands of these wagons, locating and authenticating potential Santa Fe freight wagon survivors is difficult. A good case in point lays with one of the most notable freight wagon builders in 19th century America. Joseph Murphy was an Irish immigrant to the United States who dated the beginning of his wagon-making business to 1825. His company is among the oldest major wagon manufacturers to survive into the 20th century.6 Positioned in the gateway city of St. Louis, it was his staunch commitment to quality that firmly established him as a reputable maker with desirable products. So strong was his following that, according to the recollections of one mid-1800's freight hauler, more Murphy freight wagons were used on the plains than either the legendary Studebaker or Espensheid brands7. This graphic shows an illustrated portion of an extremely rare letterhead from the Joseph Murphy wagon manufactory. When it comes to traffic on the Santa Fe Trail, the Murphy name again plays a dominant role. Here, though, the complete legacy has yet to be conclusively substantiated. Nonetheless, the story has been repeatedly told of how, in 1839, an excessive tax on freight wagons hauling goods into New Mexico resulted in Mr. Murphy building even more massively-proportioned wagons. The intent was deliberately aimed at increasing the amount of goods per load and thus helping reduce the oppressive tax burden on freighters trading in Santa Fe. While evidence of this feat seems to primarily reside in a single account by Joseph Murphy's son, Anselm, it is clear that American freighters did not appreciate the added tax and did resort to a number of alternative means to avoid it.8 Even with the cloudy claims of super-sized Murphy wagons, the reality is that Mr. Murphy is one of the - if not the - best known wagon maker with history tied to the Santa Fe Trail. 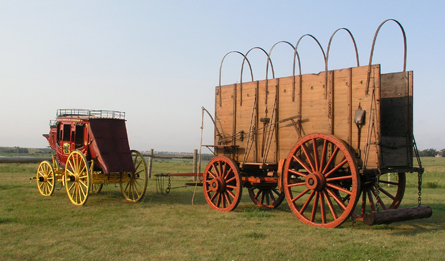 During his career, he is purported to have built in the neighborhood of 200,000 wagons.9 Incredibly, while speculation has occasionally promoted Murphy as a possible maker for a particular wagon, no wood-wheeled vehicle has ever been genuinely authenticated as a true, documentable Murphy wagon. Is it possible that like so many Santa Fe freight wagons, every one of the Murphy wagons has also disappeared? Perhaps more than a question, the thought is also a challenge. A challenge to grow our involvement, dig for details and answer the call to reclaim history while there may yet be time. From the outset of any search for antiquities, it's easy to view the passage of years as too much of an obstacle to overcome. The truth is that it's never too late to make a difference. Case in point - After searching for more than a decade for items related to Mr. Murphy, several years ago, I was fortunate to uncover more than a dozen original 19th century letters from the St. Louis firm – four of them in the pen of the elder craftsman, himself! They contain vital information on wood specifications and have helped confirm the reputation Murphy had earned for quality and craftsmanship. Further, the information provides clear evidence that someday may help lead to identification of a surviving Murphy wagon. In like manner, a little over a year ago, our never-ending search for early wagons led us to an 1878 Studebaker wagon – with a large amount of original paint still intact! It is one of 19,000 built that year and is likely the earliest production-built Studebaker wagon located to date.10 There are numerous other finds that could be shared but, the point of these brief accounts is to serve as a reminder that, even though we live in the 21st century, it is still possible to locate previously lost 19th century icons and artifacts. Like any worthy project, it takes plenty of effort, patience and unwavering dedication. Without question, the pieces to this puzzle do not readily present themselves for a quick, easy fit. When it comes to helping locate and preserve these early vehicles, it typically takes the presence of at least two specific elements for a wagon to be looked upon as a worthy element of history. First, there needs to be some type of objectively supportable provenance which gives the vehicle an identity. Second, that distinctiveness or personality must be recognized or placed in such a position to be appreciated for its significance. Absent a documented identity, too many wood-wheeled vehicles have been overlooked, discarded, forgotten and allowed to fade into oblivion. So, how does one uncover a vintage wagon's heritage? It begins with the pursuit of as much personal history as can be obtained and attached to the vehicle. Who owned it? Where was it used? When was it built? What type of wagon is it? Anything that adds to the background of a piece is valuable. 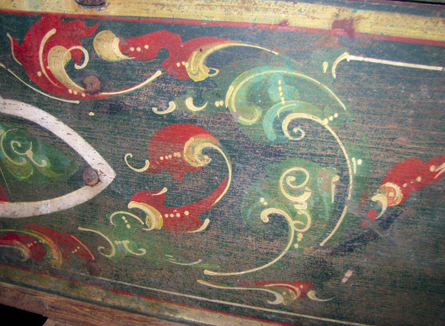 Early wagon makers often used elaborate, hand-painted striping to help draw attention to their products. This image showcases a portion of the recently discovered 1878 Studebaker wagon. When this custom paint work was created, the Battle of the Little Big Horn was still a recent memory, cattle drives permeated the American West and fugitive outlaws like Jesse James and Billy the Kid were familiar reading in newspaper headlines. At the same time an identity is being investigated, authentication of originality levels with notations of period and non-period repairs, non-appropriate additions and other deviations should be compared with pertinent and objective primary source materials. Elsewhere, it's important to take note of transitory pieces. These are wagon elements that often become separated from the vehicle and have the potential of being discovered almost anywhere. Examples include drag shoes, lock chains, feed boxes, brake parts, box rods, reach bands/plates, heavy strap iron bracing and other hardware. While not necessarily traceable to a particular wagon brand or trail, the design and makeup of these parts can often be associated with certain wagon types as well as add depth to the interpretation of individual wagon features and functions. The search for early freighting survivors of the West… It's a mission full of prospects to preserve a legacy that's as large as the making of America. For roughly three quarters of a century, these massive western machines tackled some of the most torturous terrain and historical pursuits ever attempted on four wheels. Regrettably, the vehicles today are sometimes viewed as insignificant relics tied to an irrelevant past. But, up close, their daunting size, intricate construction and individual history take on a power and presence worthy of notice. Stirring awe and imagination, they're a reminder of not only an undaunted pioneering spirit but the vision of a free people to embrace real opportunity and pursue their greatest dreams. Twelve inch wheels are mentioned in some early accounts related to eastern turnpike tolls. However, most promotional literature from noted wagon makers (1870-1890's) generally offer tire widths for freight wagons in the two to four inch categories. Western freight wagons such as the legendary “20 Mule Team” borax wagons are known to have employed eight inch tires for the softer terrain they traveled. John J. Thomas, Farm Implements, (New York: Harper & Brothers, 1855), 109-110. American Carriage Directory, (New Haven: Price, Lee & Co., 1888), 23. American Carriage and Wagon Directory (New Haven: Price, Lee & Co., 1904), 30. Wheels That Won The West® Archives; Author's extensive collection of early wagon literature covering virtually every major brand and numerous smaller makers. Wheels That Won The West® archive literature collections. R.L. Duffus, The Santa Fe Trail, (New York: Longmans, Green and Co., 1930), 110. Mark L. Gardner, Wagons for the Santa Fe Trade, 2000. Also, see James Cox, Old and New St. Louis, 1894. The National Studebaker Museum in South Bend has an 1876 wagon but, it was not a production vehicle built for the masses. Rather, it was a “show” wagon for the Centennial Exposition of that year.